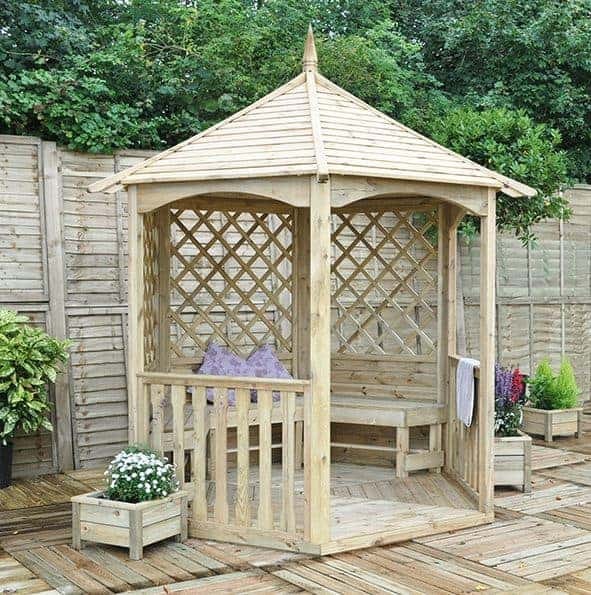 The Hartwood 9′ x 8′ FSC Hathaway Gazebo is a large and beautiful looking gazebo that just oozes class, style and will be a place where you can have a lot of fun. Its very generous size means that it is able to host a small get together with your friends or even some kind of family fun night with the kids. 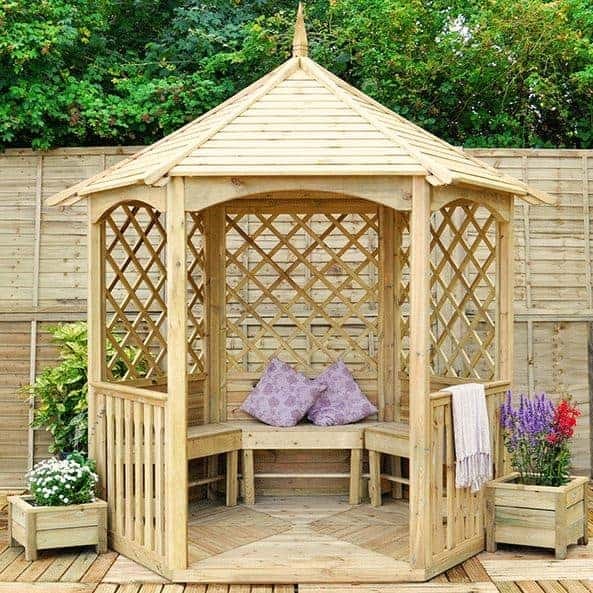 The lattice sides and high roof mean that you can have a lot of fun by decorating the gazebo so it is just the way you like it. As an added bonus a set of three high quality wooden benches are included so you will have a comfy place to sit while you are enjoying some nice food, great wine and good company in here. 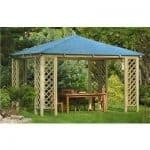 This is a very strong and long lasting gazebo as it is supported with a thick and robust frame. The floor and the roof are made with high quality tongue and groove boarding that also looks good as well as being strong. This is a gazebo which has been built to last for many years and also be able to deal with anything that Mother Nature throws at it. This is a gazebo that manages to combine good looks with a strong and long lasting design effortlessly. 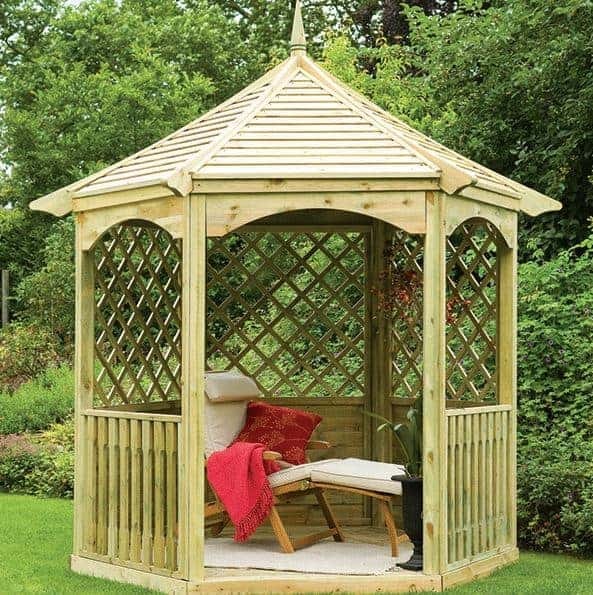 Entertain your friends and family in style or just have a fantastic place that you can call your own and relax in, with the amazing Hartwood 9′ x 8′ FSC Hathaway Gazebo. We have seen a few different gazebos lately, but this one here is one of the largest and more impressive ones. It is just high quality through and through and we are very impressed with it. At 9 feet 2 inches wide and 8 feet deep, you have a lot of room to make use of here so you could have a swanky family dinner or even something a little bit more fun like a pizza party with the kids or grandkids. The gazebo at its highest point is 9 feet 7 inches high and even along the eaves the height is good as it is 5 feet 10 inches. This is something where we feel that the pictures while showing how gorgeous it is do not showcase just how impressively large it is. There is a fantastic looking conical actually almost castle looking roof on this gazebo. We love how they have used tongue and groove boards for this roof as you are guaranteed to have one very strong and watertight roof. The roof has a very smart look to it as it does have a nice decoration on the top and the framing on the outside of it while keeping the roof strong is also very visually appealing. The back section of the gazebo has some very well made cladding that we really like. On the front though they have gone for a different, almost fence style and we really like who it looks different from what is on the back. On the back there is lattice sides so if you do have a set of green thumbs you can have some fun by using some climbing plants here. You are going to be very impressed with how robust the gazebo is and the reason it is so robust and long lasting is that the whole structure is kept together with a 45 mm x 45 mm frame that is larger than what most other gazebos offer. The framing while very thick is not something that really sticks out and is noticeable they have done an incredible job in making it blend in with the rest of the gazebo. The flooring is made with tongue and groove boarding and actually we could just leave it at that and it would be impressive, but they have actually made this flooring a major feature of the gazebo. They have done the floor in a very interesting way where the cladding is in sections so while the floor is in a hexagonal shape they have used two slightly different colours for the floor and it looks great. 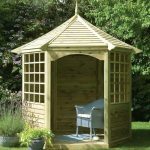 We would certainly recommend that you treat the Hartwood 9′ x 8′ FSC Hathaway Gazebo within a week or two after installation and then also once a year after. 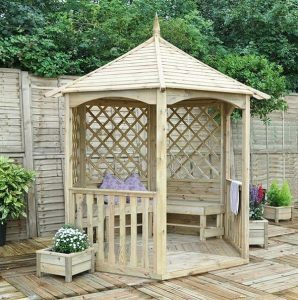 This way you will ensure that the wood is well protected from rot and you will be able to use the gazebo for many years. 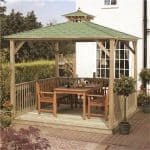 You do get a 15 year anti rot guarantee with this gazebo and we feel that this is very fair, but in order for this guarantee to be valid you have to treat the gazebo properly and look after it in the right way. 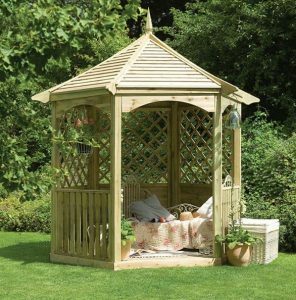 The space inside the gazebo is great and offers you plenty of different possibilities when it comes to how you lay things out. One thing that is really great about this is that they actually give you three timber benches with the gazebo. You can see these in some of the pictures and they are of a high quality and will be comfortable for you when you are enjoying a glass of wine. These are supplied flat packed so they will have to be built once you have finished the rest of the gazebo. The gazebo is heavy and sturdy so you have no worries about the wind causing any kind of havoc. It is one of the more sturdy gazebos on the market right now and the weight of the wood and the way it is built will ensure that it stays strong and stable for many years. You can have a lot of fun customising this gazebo. You can always change the colour of it with some paint or a coloured wood treatment. Of course there is the lattice sides where you could hang some plants and speaking of hanging the gazebo is full of places where you could place or hang decorations like wind chimes and hanging baskets. 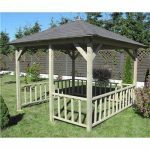 Only one extra is offered with this gazebo and that is their 10′ x 8′ Ecobase Plastic Shed Base which will give you a strong foundation to install the gazebo on. As great as this is, it is not something that we see as an essential extra, and at £199.99 it is priced rather highly as well. A truly fantastic job has been done on this gazebo. They have really made sure that the quality is of a high standard from the bottom all the way to the top. 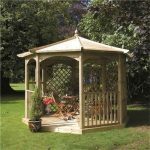 The materials used for this gazebo are of such a high quality that you are easily going to get many decades of use out of this. While it will require a little TLC from you, this is still a fairly low maintenance gazebo. This is far larger than the pictures suggest so it will take up a fair bit of space in your garden, but it does offer you plenty of room to relax or have a few friends over. While not what we would class as a job so hard it will make you cry. This can be a little on the challenging side so be sure to do what the instructions tell you, have a good buddy to help out and also have plenty of drinks and snacks on standby for when you need a break. Look everything about this gazebo is high quality, but at just under two grand it is a very expensive addition to your garden. Final Thoughts: We really could not be any more impressed with the Hartwood 9' x 8' FSC Hathaway Gazebo. There really is nothing about it that made us raise our eyebrows in disapproval. They really have done just an incredible job with it. The size is just ideal as it offers plenty of room, the design is great as it is very easy on the eyes and the materials used are just top of the line. 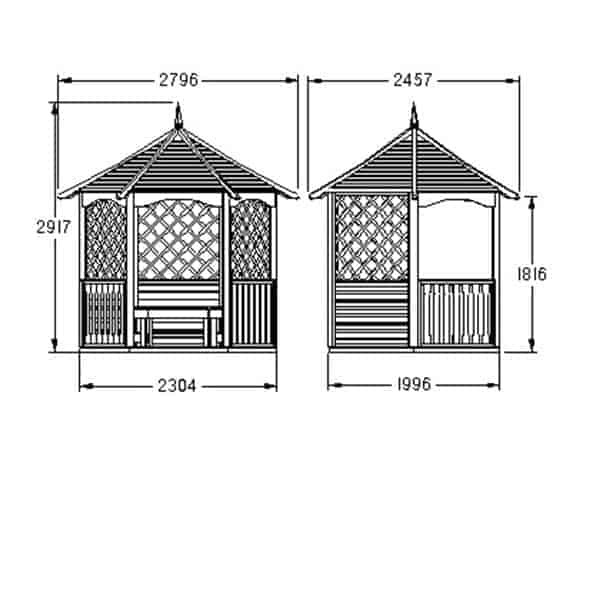 The thing is with the high quality and overall size of it the price is very high, it is actually one of the more expensive gazebos we have seen, but at least you know for this price you are getting one of the best gazebos on the market.